The knuckleshot is an awesome shot, and definitely a skill you have to master. It is fast, it is powerful, it is unpredictable, it is hard for any goal keeper to keep out of the net. Even if the goal keepers manage to get a touch to it, they are unable to hold on to it. This allows strikers in the box to pounce on the rebound and score an easy goal. A knuckleshot is a great way to score, but it might be quite a challenge to pull off the shot. In this post, I shall offer a few tricks, which I hope to smoothen your learning curve. It does not matter whether you are playing PES 2011, 2012 or 2013, as the way to execute it remains the same. Press Shoot to charge up power to desired amount. Tap shoot just before the player makes contact with the ball. The timing for the second step is crucial. Too early a tap will send the ball sky high, while any delay makes no difference to the shot. So when do we tap the shoot button the second time? Tap shoot at this time. This is the moment. Tap shoot the moment when your player swings his leg back to strike the ball. The technique and timing is similar, for both set pieces and open play. This may get some getting used to, but once you get the hang of it, you will be tempted to take a knuckleshot from way out at any opportunity! A point to note is that not every player in the game has the ability to pull off a knuckleshot. If you have been practising with one player and it is just not paying off, move on to the next. A recommended way to begin training will be to start off with Cristiano Ronaldo. After you have more or less grasped the timing, you can move on to try this out with players in your team. Established strikers in the game may not execute it no matter how hard you try, while some generated young players in the Master League can pull this off, thus you may want to give everyone a chance. So how do you know if you are doing it right? Simply, a normal shot spins, while a knuckleshot does not. Do check out your replay after every shot and adjust your timing according. Something to note is that personally I find it easier to execute a knuckleshot during a free kick, as opposed to open play. If you are attempting this shot in open play, it is also worthwhile to note that knuckleshot can only be executed from long distance. I would estimate it to be beyond 30m from goal. If we were to divide a soccer field into 4 quarters, with our penalty box being the first quarter and the opponent’s penalty box being the fourth quarter, we should only attempt knuckleshot in the third quarter. Once we enter the fourth quarter, it may be hard for a knuckleshot to be executed. And here is a PES video showing a demonstration, and a knuckleshot goal. It’ll be a busy weekend in training mode for me! Thanks! Glad that you find it useful! Hi Zed, for keyboard settings, what do I press for R1 and R2? Thanks for your help. hey brother thanks a lot for your help in this game,i found them very interesting and especially this one,although my biggest challenge for pes 2011 right now is to dribble my opponent in the field. I’m finding it very hard to do and i would really appreciate it if you could give us some tips to master our dribbling too please..
Neo, you are the man,keep doing this,this is crazy…. Hi,Neo. Is there any chance where you will do a shooting tutorial? I really don’t understand the essence of shooting in this game. IN PES 2010, When you are 1 on 1 with the keeper, Its usually 90% goal. But in Pes 2011, I feel its 50-50 chance. Whenever i have an opportuniy to shoot 1v1. Funtastic tutorial!But this is for pc or ps3? do you have another way to do that? My video is from the PC version of PES 2011. I am afraid you might have to work on your timing, as this would be the only recognised way.. Good luck! Sure I will work on that! Thanks! Glad I could be of help! Regarding your query, I would like to point out that when the ball sail way over the crossbar, it means that u have pressed the shoot button too early the second time. Perhaps you would like to delay your timing by a little. I would not say that it is exactly when the foot is at the highest, or the instance he hits the ball. The whole situation happens to fast, for me to be able to accurately determine the exact timing. However, I would believe the timing will be when the player’s foot is swinging down from the highest point. In addition, it will be too late when he has made contact with the ball. Hope this helps, Yaeesh! The second shoot right before the contact with the ball…its just a simple click or full bar? when you shoot you choose a side?or its just shoot? Hi Milton, the second shoot will be a simple click. The power bar is not supposed to increase when done right. Good luck! I will try it hard! You will have to try to tap shoot once, and tap shoot again the second time before the striker make contact with the ball. the first shhot it´s at midle bar or quarter?and the second is just before the leg contact with the ball right? C Ronaldo is the best player to try it. For the first shot, it does not matter how much power you accumulated. The second is during the period where the player swing his leg back, to just before the contact. Great tutorial, didn’t even know of knuckleshot :D.It looks cool but I barely score even in tutorial mode. P.S: Can you bring some examples of players who can do it? NO way…. to score…the shoot it always with power…not it effects! Neo, the second shoot is when the leg is backing or when the leg ir right to shoot? And also the website is great.Its got loads of technique. Also i have a psp .can you give me reply according to its keys Plsssssssssssssssssssssssssssssssssssssssssss! Can someone tell me how can i do topspin free kick?? ?I allready mastered knuckleball…. I think pressing Up during the freekick will help? It adds power to it. Oh is hard to say how many second.. i believe you must press shoot at the point where the striker swing his leg back. oh the directional button will not matter much but usually i just held on to it. i think if you are running at speed the shot power will be higher. Various players can do this, though these players differ from versions. 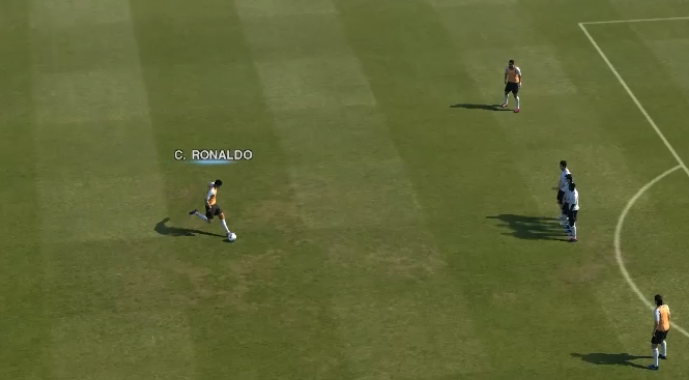 In PES 2013, players will the Knuckleshot skill card will have a higher chance of executing this shot. This may not be possible in the PSP..
Power should be around half, slightly more if you are quite far away from goal. The delay between pressing the shoot button is rather short. You should press the second shoot when the leg is swung back to the maximum. Ronaldo is the main man 🙂 Check out the skill cards in PES 2013!